Designed under the direction of Ferrari's Styling Centre with the collaboration of Pininfarina, the latest Ferrari one-off model, the SP 275 rw competizione, is built on the chassis of the F12berlinetta but equipped with the more powerful V12 engine and gearbox from the limited-series F12tdf. The characteristic front engine-bay vents of the 275 GTB are an evident styling cue, as is the adoption of the triple louvres in the three-quarter panel in place of the F12berlinetta's B-post quarterlights. The louvres on the rear bumper, together with the pronounced nolder on the tail and milled aluminium fuel filler cap, recall instead the special competition-developed 275 GTB (chassis number 06885) that won the GT category in the 1965 Le Mans 24 Hour race, coming home an impressive third overall behind the winning 250 LM. 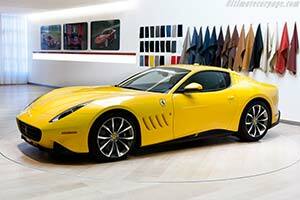 The yellow paint scheme is also a tribute to that 275 GTB, echoing its Ecurie Francorchamps team colour. The front features a closed perimeter Ferrari grille with a prominent yet smoothly integrated bonnet bulge, while the slim, vertically-stacked headlights and forged 20" alloys are unique to this car.